Detroit City Chess racks up accolades! Dubbed "The Princess of Chess," Medina Mathis of Detroit's Cass Tech traveled to Chicago for the All-Girls National Open Chess tournament sponsored by the KasparovChess Foundation. Mathis took 2nd in the under-18 category while Cass Tech won 1st place in both the under-14 and under-18 team categories. "Like me, most people consider me as the best female chess player in Detroit. That's good and all but I want more than that." Medina is in her junior year at Cass Tech and is known as the strongest female player in the city of Detroit, but is not content. She posted the following message on the Detroit City Chess discussion board to another player who was a self-proclaimed "best player in her school." "It's fine and well to be the best female chess player in your school, but why not in just striving to be the best chess player in the world! I know it's good to be called the best female chess player in the school, but that's not going to do you any good in the real world. To them it means nothing. Like me, most people consider me as the best female chess player in Detroit. That's good and all but I want more than that. 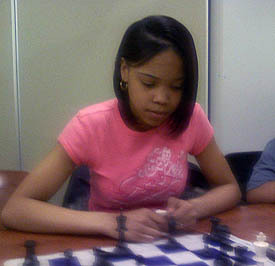 I want to be the best CHESS PLAYER not just the best female chess player in Detroit, MI, and then the World. So don't accept anything at or below mediocrity. And strive to be the best you can be." Canty wins Michigan State title! Jimmy Canty III has won his second consecutive High School title. Last year he won the title on tiebreak, but was not eligible to compete in the Denker because he had not entered high school yet. Now a freshman at Cass Tech, the Michigan Individual State title gives him the right to compete in the Denker tournament. Canty led Cass Tech to city championship and a 4th place finish in the Michigan State Championship team event. He won an individual gold medal for his performance on 1st board. 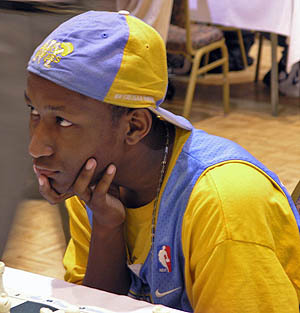 Canty made his last push in eclipsing the "Expert" rating barrier when at the Chicago Open last May. He scored an impressive 5-1 and tied for 2nd in the under-2000 section. Jimmy also scored 5½-3½ in the under-2000 section at the World Open. Recently, he placed joint 2nd with NM John Brooks in a mini-Swiss event won by Aaron Kahn. "I'm trying to get to Master as quickly as possible." Detroit's Duffield racks up medals! 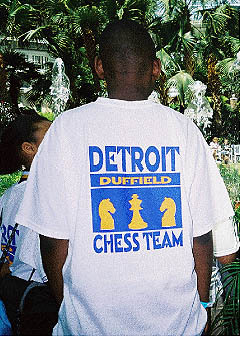 "This past weekend Detroit Duffield won the State Elementary Chess Tournament at Michigan State University in Lansing. We beat several top rated teams from Country Day to teams in Ann Arbor. This also marked the 1st time a Detroit elementary team has won a state chess tournament. Detroit has won Jr. High and High School State Chess Tourney's but never a elementary." Capping off a fine year for Duffield are several honors from the Michigan State tournament. The team was represented in Sacramento, California for the K-9 National Championships (March 30th-April 1st) where they also won a number of awards. Photos can be found at Detroit City Chess Club website. Duffield is coached by Kevin Fite serving as the team manager/advisor. Duffield players proudly donning t-shirt at 2005 Supernationals III.